COMMUNITY EVENT, FUN FOR ALL AGES, FREE to ATTEND. On September 21-22, 2019 the Oceanside Chamber of Commerce along with Tri-City Medical Center and Genentech will present Oceanside Harbor Days at the Oceanside Harbor. The event will feature arts and craft exhibits, great food and fun activities for the entire family. The event is open from 9:00 a.m. to 5:00 p.m. both days. Two event filled days of sun, sand, and surf provide an outstanding opportunity for residents and neighbors to experience fun activities including a costume party for kids 12 and under (accompanied by parents) at Pirate Village, Arts, Crafts and Food booth areas, Nail 'n' Sail Competition, Military, Public Safety displays, music, a beer garden (patrons 21-years old and over with a valid ID showing proof of age required to enter) and more. Harbor Days is free to the public and is hosted by the Oceanside Chamber of Commerce and Oceanside Harbor District and presented in partnership with Genentech and ​Tri-City Medical Center. SPONSORSHIP BENEFITS FOR YOUR BUSINESS. Harbor Days is Oceanside's largest annual community event. It's well known in the Oceanside, a longstanding and popular event, offers a range of fun activities, entertainment, food and shopping, and is designed for all ages. This event offers a truly one-of-a-kind opportunity in the community of Oceanside. It's designed to offer businesses a face-to-face chance to interact with audiences including local residents, businesses, tourists, and military. For attendees, it presents a wonderful opportunity to enjoy the outdoors and our gorgeous southern California weather. At the same time, guest can participate in activities and entertainment designed for varied age groups. Or simply choose to watch the festivities, meet up with friends, spend time with family, and experience varied tastes, sips and shopping. Businesses, vendors, nonprofits, candidates, community groups, and all those interested in participating with a booth space, due to the magnitude of this event, the Oceanside Chamber has partnered with Kennedy and Associates to have Kennedy personnel directly book, coordinate and accept payment for vendor booth spaces. The Oceanside Chamber is taking no booth reservations, nor quoting booth costs for this event. Please download a booth vendor packet, which includes an application, along with full details on each type of booth space, fee, and instructions on how to submit your application, and/or contact Kennedy and Associates, to participate. We look forward to seeing you there! ​TIKI SWIM. PIRATE VILLAGE and COSTUME PARTY, NAIL and SAIL. See further information along with application(s) to download on the right side of this page, as well as information about parking, shuttle, and lodging. Oceanside Chamber of Commerce, Genentech, Tri-City Medical Center, Cox Communications, University of Phoenix, Sprint, Frazier Farms, North County Health Services, Pacific Marine Credit Union, Prohibition Brewery, Rincon Band of Luiseno Indians, Scripps Health, San Diego Union-Tribune, Waste Management of North County and Welk Resorts. View a Few of Our Harbor Days Videos Below. View Harbor Days Nail & Sail Aerial View video ​below. Harbor Days sponsorship offers a great branding opportunity for companies interested in a strong presence in Oceanside's best event. If you are interested in this great opportunity, please download a sponsor packet, or call Kristi Hawthorne at 760-722-1534. Download Sponsorship Packet or Signup Forms. Garage (located at Cleveland St. and Seagaze Dr.) with free shuttle service from the North County Transit Center. Your boatbuilding and sailing skills (or luck) can be showcased on Sunday, at this year’s “nail and sail” event. Boatbuilding begins at 10:30am and Race begins at 2pm. Choose from a wide variety of great places to stay including hotels, motels, and lodging in Oceanside to book a convenient local place to stay while enjoying the lovely beachside City of Oceanside community and our fun-filled events including Harbor Days weekend! OCEANSIDE HARBOR DAYS HISTORY. PAST OCEANSIDE HARBOR DAYS STORIES, NEWS and PHOTOS of NOTE. 1st Harbor Days in 1960 Sponsored by Oceanside Junior Chamber of Commerce. ... In 1960 the Chamber was led by George Hillam. That year Oceanside Junior Chamber of Commerce sponsored the first Harbor Days – even before the Harbor existed at the Del Mar Boat Basin. The Mayflower II, the only U.S. commercial blimp, owned by Goodyear Tire, floated over Oceanside on the evening before the Harbor Days illuminated a 10-foot high message publicizing the event, it was announced today. During that year, the Oceanside Chamber held a Harbor Bond Day seeking one thousand Oceansiders to contribute $1 each for purchase of the first $1,000 bond in the $4 ½ million bond issue to finance harbor construction. Ben Weseloh and James Ellis were the heads of the Harbor Bond Committee. Oceanside celebrates one last hurrah of summer with its annual Harbor Days on Saturday and Sunday. The free family-oriented event encompasses the entire harbor and enlists the services of the Marine Corps, merchants and entertainers, among others. Oceanside CA— The Oceanside Harbor Days organizer, Oceanside Chamber of Commerce, is encouraging attendees to wear their best pirate costumes during the special weekend event, Saturday, September 26th, 9:00 a.m. to 6:00 p.m. and Sunday, September 27th, 2015, 9:00 a.m. to 5:00 p.m. This multi-attraction event is presented by Genentech and Tri-City Medical Center. 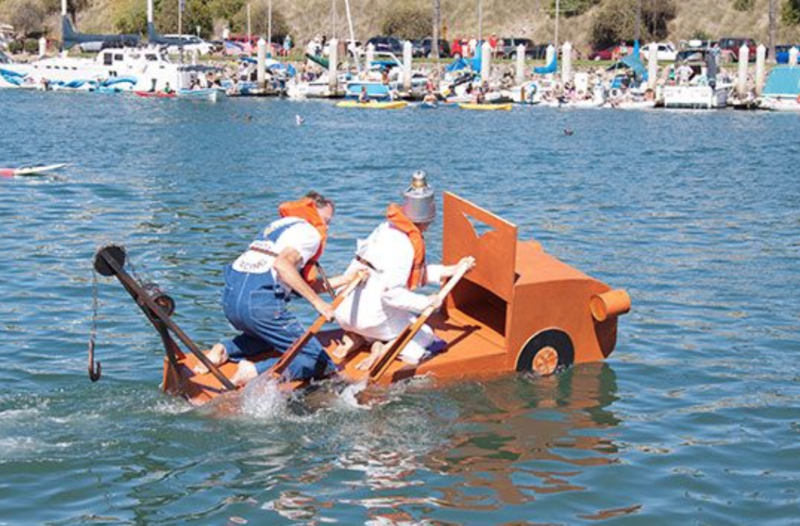 ... With Nail and Sail, three-member teams have two and a half hours to build a boat from scratch that they will race across the harbor, around a buoy and return to the dock. OCEANSIDE: First day of Harbor Days draws thousands.